The main types of pig fat can be found in the back (including the shoulder and rump), the belly, and the kidneys (called leaf lard). Although leaf lard is the cleanest, whitest, and best fat for making pastries, I’ve never had any complaints when using back or belly fat to make pie or tart crusts. 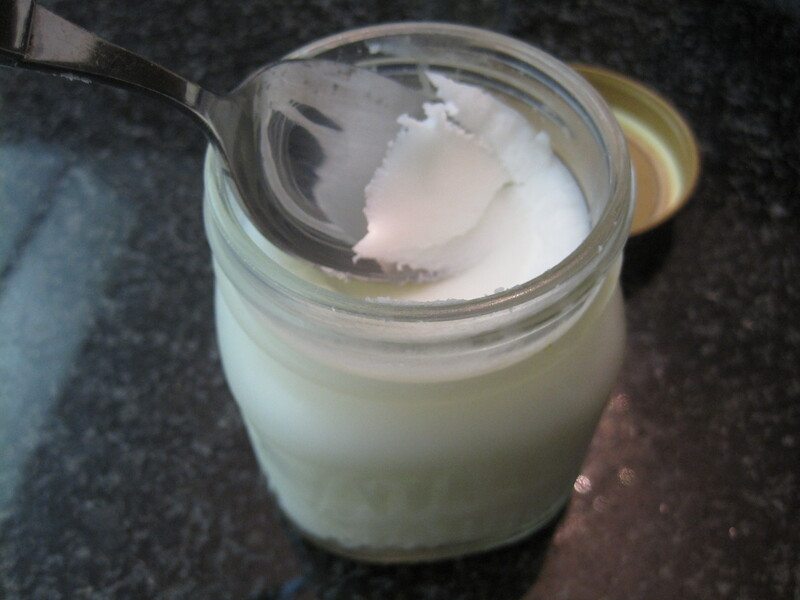 Although it is very easy to render lard, it doesn’t make sense to render less than 1 or 2 pounds of lard at a time, because the process will fill your home with a distinct odour that is, to many people, unpleasant. But luckily, rendered lard will keep well for at least a month in the refrigerator and even longer in the freezer. If you’re not butchering a large, fatty piece of pork or if you don’t have easy access to a farmer/butcher that sells pig fat, then you could collect scraps of pig fat from every day cooking in the freezer until you have enough for one batch. Another great thing about rending your own lard is the pork cracklings that are left over (photo below). Use a meat grinder or a food processor fitted with a metal blade to grind up the pig fat. Alternatively, you could ask your farmer/butcher to grind the fat for you. Render the ground fat over low heat. You could do this by using a slow cooker set to low, or by using an uncovered Dutch oven in the oven preheated to 300 degrees F, or you could use a heavy bottomed pot or Dutch oven on the stove top set to a heat that is high enough to melt the fat but not high enough to burn it. Stir occasionally to prevent burning. If you are not able to watch the fat closely, then you may want to add 1/4 cup of water to the pot at the beginning of this process to help prevent burning. The water will evaporate out. The rending process will take up to 8 hours. The fastest method is over the stove top. When the top layer of liquid melted fat has separated from a bottom layer of pork cracklings, turn off the heat and allow to cool slightly. 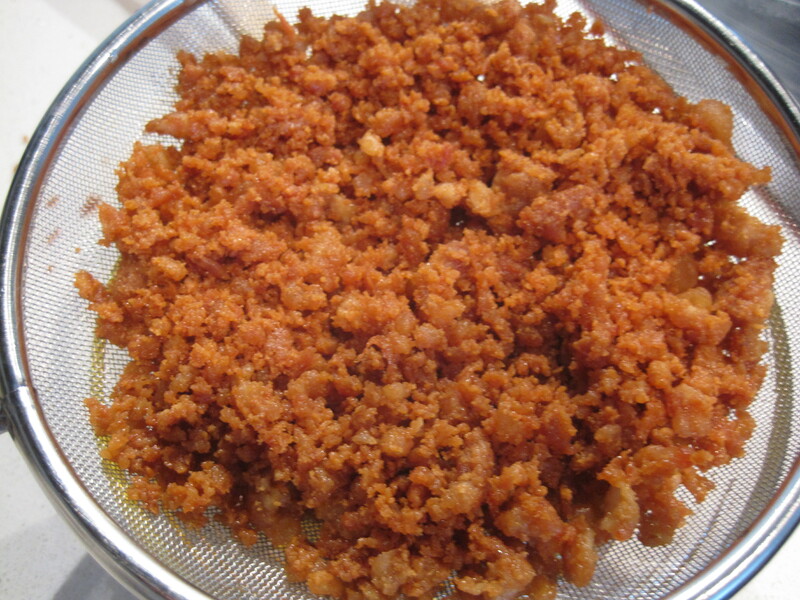 The cracklings will be soft and will look like ground pork. Then pass all of the melted fat and cracklings through paper coffee filters (that have been set up in a manual drip coffee maker or sieve or funnel) into a sterilized glass jar. It will look yellow in colour, but don’t worry, because it will whiten when it solidifies in the refrigerator. Screw on the lid, not too tightly, and allow to cool at room temperature. Then store in the refrigerator for up to 1 month or in the freezer for much longer. In a heavy bottomed saute pan, heat the leftover cracklings over medium high heat until they become brown and crispy. Add a pinch of sea salt to taste, if desired, and serve on salad. Or, if you have a dog, you could mix this in with your dog’s food as a treat. Note: Don’t salt the cracklings if you are feeding them to your dog. Lard can be melted for deep frying or stir frying. Lard can also be used in combination with or instead of shortening and butter in baked goods recipes, especially pastry dough.